Kingston, ON, K7L 3N6, Canada. 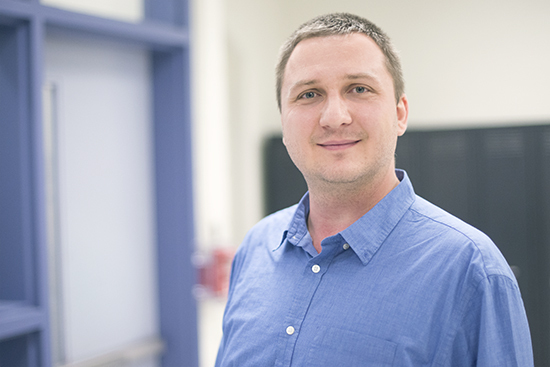 Following the award of his PhD at Eötvös Loránd University, Budapest, Hungary, Levente Balogh completed postdocs at the Los Alamos National Laboratory and Queen’s University. He was employed as a Research Scientist at the Canadian Nuclear Laboratories before joining Queen’s faculty in the Department of Mechanical and Materials Engineering as a member of the Arthur B. McDonald Institute. Irradiation effects on the performance of structural materials: Irradiation with high-energy particles changes the microstructure of materials which strongly affects their mechanical properties, which can lead to swelling and embrittlement of nuclear reactor components. Research advancing the understanding of radiation damage is crucial for the safe operation of current and the safe design of next-generation nuclear reactors. The accelerator at Queen’s’ Reactor Materials Testing Laboratory (RMTL) is used to bombard materials with high energy protons and the changing microstructure is investigated with X-ray and neutron diffraction, advanced synchrotron characterization techniques (high-energy X-ray diffraction microscopy, micro-tomography) and electron microscopy to better understand radiation-induced damage. Astroparticle physics research, dark matter detectors: The proton accelerator at the RMTL can also be used to generate neutron radiation, which in collaboration with the Arthur B. McDonald Institute, is used for physics research, such as developing methods for testing and calibrating dark matter detector prototypes as well as various other experiments. Characterization of advanced materials, additively manufactured metals: Components fabricated with novel techniques, such as Additive Manufacturing, can develop uncommon microstructures which have a strong influence on their mechanical properties and performance. X-ray and neutron diffraction, advanced synchrotron characterization techniques combined with mechanical testing and microscopy methods are used to explore the microstructure - mechanical property relations of these materials.